Good, attractive, fun-to-read title. I didn't care for the way the eventual turtle movement felt in my mouth when I read it aloud, though. It didn't seem to flow right. So I didn't end up using this one for storytime. Still, it's a cute book. I used this book to teach figurative language to my 8th grade language classes! Examples of: onomatopoeia, rhyme, alliteration, assonance, and repetition! 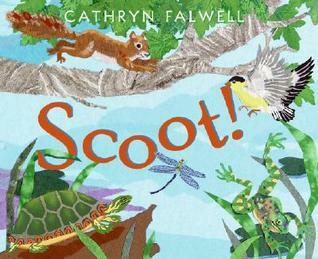 Title: Scoot	Author: Cathryn FalwellArtistic Media Used: CollageA Brief Summary: This book is about 6 little turtles on a log. These turtles are quiet and motionless. All the animals are moving around these turtles. The waves pick up and then the turtles finally move. They move quickly away from the waves. Analysis of ArtTexture: The reader can tell that the pictures are made out of paper. Especially the trees and landscaping, you almost wish you could touch it. Color: The story is very colorful. Each animal uses at least 4-5 colors. This aspect will get the attention of the younger generation. The book casing and jacket have the same picture. I would use this in my classroom for individual reading and for art projects. Different stamping ideas and techniques are located in the back of the book. This book could be used to transition into a discussion about the environment or science observation. Originally rated G+ By Lucy Thomas Large, simple rhyming text is enhanced by the colorful and detailed paper collage art illustrations. Following the story, the book incorporates the use of science and art. From her tree house at Frog Song Pond, the author provides some factual and interesting information about some of the birds, animals, insects, and plants she has observed in the pond area. The final page of the book is entitled “Printing Textures” which explains to the reader different ways to use paint on a variety of objects (e.g. bubble wrap, tree bark) and press the object onto paper to make a different type of art work. Small sample pictures are provided. A worthwhile addition for the picture book collection in any elementary school library. Also, can be used for the science topic on pond life – its animals, plants, etc. 3.5. 5 stars for the over-the-top-gorgeous illustrations, great active verbs/vocabulary (perch, lurch, scamper, dash, skim, scurry, etc), and recurring line "But the six silent turtles sit still as stones" (which kids can deliver in storytime). But "Fern fronds rustle.Butterflies bustle.And the six startled turtles...suddenly speed away! "felt disappointing and anticlimactic (2 stars for that!). Taking the time to say "suddenly" almost always makes things feel less sudden. "Speed" isn't as strong an "s" verb as I'd like for an ending. "Splash" is obvious but could pack more punch. Others? Could be lovely to share one-on-one or in small group before nature walk. Note to self: the book's set in summer (summer storytime? Outdoors storytime?). This is a delightful book, in rhyme, about a pond and all the wonderful creatures that live there, among them six silent turtles who do very little for most of the book, but sit idly on a log and watch everyone else. Cathryn Falwell’s illustrations are gorgeous, filling her pages with almost 3-d images. She uses special ways to gain texture (like in the tree trunks) and explains how in the back of the book. The poetry comes naturally between pauses that look at those six turtles sitting still as stones. For example, “Wood ducks glide./Water striders slide./Salamanders dash./Tadpoles splash.” Very fun. This would be a good experience in rhyming for young readers and writers. There is more information about the animals in the backmatter, too. Beautiful collage artwork. It's definitely aimed at younger readers and pre-readers. It would be good for helping to learn vocabulary and alliteration. I think if I had read it on its own and not at the same time as a few other picturebooks that I enjoyed more, it would have been more memorable for me. As it was, it completely slipped my mind until I came onto Goodreads to review my latest stack of books. I like this book, it talks about animal behavior in simple sentences. Noun and verb. Beetles creep. The turtles sit silent as stones. The variety of verbs in this text will lend itself to lessons about action words. Each page has a variety of animals students can find and count the animals. The animals appear through out the text so it could lend itself to an addition lesson. grades K - 2nd. This book talks about the day at the pond for the animals. It describe each of the animals and different aspects of nature as they flow down the pond. This book could be very interactive with the students using noises from the animals and nature. It could also be used with the idea of talking about the different species that would live in water compared to land. 0-7nice pond rhymes about all the life and movement of a pond. while the "green frogs leap. beatles creep. finches purch. herons lurch." etc, the "six green turtles sit still as stones" -- we meet a variety of pond animals...and the turtles remain silent and still until a gust of wind takes their log down the stream. The illustrations are in colorful paper collages. Paper art illustrations about a summer pond. Great for vocabulary. Not a story, though there is a simple repetitive phrase that ties it together and offers a conclusion."Wriggle! Waggle! Scuttle! Skim! On every reed and stone and limb! But the six silent turtles sit still as stones. "Toddler through early elementary. Cathryn Falwell playfully describes the actions of various animals bustling in Frog Song Pond. While the other animals are active, six turtles rest silently on a log until a strong wind sends them scurrying away. Nice selection for young children interested in wild life. The lyrical rhyme of the book makes it an enjoyable read aloud. Also the back pages provide several learning extensions. This is a cute story with vibrant illustrations. It has a lot of fun words to read aloud. For example: "Wriggle! Waggle! Scuttle! Skim!" I also like the details at the end about the animals, for kids who want to learn more. Gorgeous artwork, and fun text it's based on. Love the "notes" at the end, which may serve as an entry point for older readers who may enjoy the artwork--it tells them how to create their own--as well as talking more about the animals she's illustrated. Green frogs leap...Beetles creep...Finches perch... Herons creep...But the six silent turtles sit still as stonesuntil ?? ?Fabulous use of language and illustrations that take you right into the pond setting will make this book a favorite at story time. Fun, sing-song narrative and gorgeous paper collage illustrations make this a wonderful book to read aloud with children, pointing out all the neat creatures along the way. The alliteration and onomatopoeia are really fun and we've read this one a few times. Beautiful illustrations compliment rhyming and alliterative text. Six silent turtles sit still as stones while other animals dance around them. Wonderful for nature centers/ nature storytimes. Identification and facts about the animals on the last page. This is a beautifully illustrated repetitive, rhyming book. It has wonderful adjectives and descriptive words. It also gives many examples of animals/birds/bugs/etc. that live near bonds. WOULD BE A GREAT READ ALOUD. I adored the wonderful collage artwork that incorporates actual pieces of nature (a found piece of wasp nest used in the wasp nest)into the design. The rhythmic story would be wonderful for storytime and I loved the author's notes in the back. Caldecott worthy. The pictures and text are outstanding and I like the factual info in the back. I especially like that the artist shows how different textures in painting can be created. A little counting, lots of adjectives and some rhymes. Good information in the back couple pages on "Notes from Frog Song Pond". Gorgeous illustrations, but didn't work well for my storytime. Cute poem, excellent art. I love that the author includes science and art notes at the end. We're going to do some art projects using her methods. This book would be good for the preschool and Kindergarten classes. I liked the sounds all the animals but the turtles were silent till the ending. The book introduces animals, reptiles and insects that live near a pond with rhyming. Book provides science vocabulary building. bold and colorful illustrations great for story timeSix silent turtles sit still as stones on a log, as energetic movement by the other animals in the pond happens all around them.